Note4man 1 year, 7 months ago. Android Nougat 7.1 ROM, Galaxy NOTE 4 LineageOS 14.1 has now arrived via an UNOFFICIAL build. THIS IS ONLY FOR SNAPDRAGON VARIANT. If you want some more Lineage ROMs or wanna taste the OFFICIAL Lineage build then stay tuned the Lineage OS 14.1 ROM collection page. Before this ROM there was the CM14.1 for Galaxy NOTE 4 (for Exynos variant). 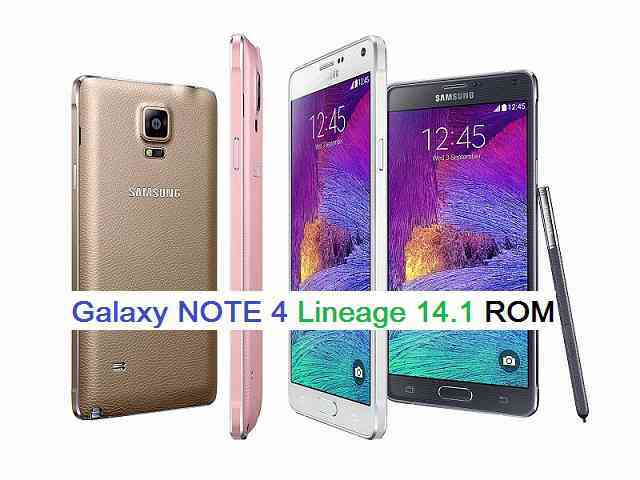 If you are looking Lineage for Note 4 then here is the Lineage 14.1 for Galaxy NOTE 4 T-Mobile. This Lineage 14.1 for Galaxy NOTE 4 (trltexx) is brought to you by developer _mone. THIS IS AN INITIAL BUILD WHICH MAY NOT BOOT AT ALL. HAVE A BACKUP BEFORE FLASHING THIS AND TRY AT YOUR OWN RISK. Installing a custom ROM on a Galaxy NOTE 4 (trltexx) requires the bootloader to be unlocked on the Galaxy NOTE 4 (trltexx) phone, which may VOID your warranty and may delete all your data. Before proceeding further you may consider backup all data on the phone. You are the only person doing changes to your phone and I cannot be held responsible for the mistakes done by you. – Here is theTWRP update guide for the Galaxy NOTE 4 (trltexx). This TWRP recovery guide requires an unlocked bootloader on the Galaxy NOTE 4 (trltexx). Download and Copy the GApps and Lineage OS 14.1 for Galaxy NOTE 4 ROM ZIP to your phone. First flash the Lineage OS 14.1 for Galaxy NOTE 4 ROM ZIP from device. Then flash the GApps zip from your device memory. Reboot and Enjoy the Nougat 7.1 Lineage 14.1 ROM for Galaxy NOTE 4 (trltexx). Copy the latest Lineage OS 14.1 for Galaxy NOTE 4 ROM ZIP file to your phone. Stay tuned or Subscribe to the Galaxy NOTE 4 (trltexx) forum For other Android Nougat ROMs, Lineage OS 14.1 ROMs, other ROMs and all other device specific topics. Will the work with the Sprint Note 4 (TRLTESPR/SM-N910P)? As per the updater-script file this ROM is built only for trltexx and trltedt. But if you feel like the hardware spec is same between trltexx and trltespr then you can remove the assert command from the updater-script and install it on NOTE 4 and see if you can boot. Proceed if only the hardware spec is same. Flashing a ROM built for other device may damage your phone badly and may brick completely. Wifi doesnt work. The password i enter is 100% correct yet it fails to connect. Please fix. Sorry, my post above isn’t true. The WIFI works. However, mobile standby is a major battery drainer (50% +). The device also gets really hot, really quickly when playing a heavy res game. Can you please reply or fix these issues.